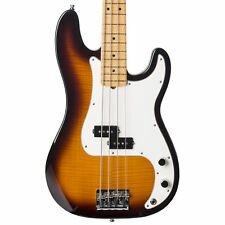 Fender® Select Jazz Bass®, Rosewood Fingerboard, Amber Burst. Custom G&G Fender Select case, strap, cable and polishing cloth included. Amber Burst. Jazz Bass®. Truss Rods. Fender® Select Single-Coil Jazz Bass®. SN: US12235559. Loud, clear and deeply resounding tone issues from the new single Fender Select Precision Bass split-coil pickup. Gloss Lacquer Body Finish. Satin Lacquer on Back, Gloss-Lacquer Front Neck Finish. Loud, clear and deeply resounding tone issues from the new single Fender Select Precision Bass split-coil pickup. Sheet Music. Loud, clear and deeply resounding tone issues from the new single Fender Select Precision Bass split-coil pickup. Truss Rods: Posiflex Graphite Neck Support Rods. Neck Finish: Satin Lacquer on back, Gloss Lacquer on front. 2 Fender Select Jazz Bass Pickup. Active jazz bass of Fender's finest line Select series! Original PU, Select Jazz Bass PU. w/ Fender tweed Hard Case. As above is reference. Operation check, cleaning processed. -Product rank (B) S.N : US13028824. Features ?. Remarks: sound of the original pickup Select Jazz Bass Pickup has been installed, you feel like glossy nuance to the fender tone with a sense of security has been positive. Body type: JAZZ BASS. · With a hard case. As above is reference. Operation check, cleaning processed. -Product rank (B ). Why choose us? 2 Years Guarantee Our Products are 100% Authentic. You always have the right to a 2-years guarantee. We have experienced many international shipping. We guarantee the safety, security, and privacy of your valuables. Loud, clear and deeply resounding tone issues from the new single Fender Select Precision Bass split-coil pickup. Satin lacquer finish on back of neck with gloss lacquer on front. Gloss lacquer finish. Feature Remarks The satin finish on the back of the Quarterson maple neck enables smooth fingan ring to improve playability. Feature Remarks The sound is an original pickup Select Jazz Bass Pickup It feelsthe fender tone with a sense of security has been added with a luscious nuance.